A better appreciation for baseball’s current state of affairs can always be achieved by examining its past. For 2017 and beyond, the fortunes and hopes of the Pittsburgh Pirates rest on the pitching arms of youngsters Jameson Taillon, Chad Kuhl, Trevor Williams, and Tyler Glasnow, once he returns to the big show. In a year when these young men leave their first impressions at the major league level for a full season, the story of the greatest performance by a rookie hurler in team history deserves attention. Performing on baseball’s grandest stage in the 1909 World Series, pitcher Charles Benjamin “Babe” Adams became a household name due to his heroic effort against the Detroit Tigers. Charles Adams was born on May 18, 1882, in Moorefield, Indiana, before his family moved to Tipton in that state one year later. Adams spent his formative years working on his parents’ farm with his siblings, until the family sojourned to Missouri. After relocating to several places in Missouri, Charles’ parents finally settled in the town of Mt. Moriah when he was sixteen. It was here that Adams experienced his first taste of playing organized baseball. Charles eventually joined the Mt. Moriah town team, which dominated the competition in that area. Adams started garnering attention when the Mt. Moriahs entered a baseball tournament at the Harrison County Fair. Although the team had been given little chance of advancing past the first game, Charles was brilliant on the hill, as Mt. Moriah won the tournament, and took home a $500 prize given to the victors. Adams’ newfound reputation as a big-time pitcher caused managers and scouts from that area of the country to be in hot pursuit of the hurler. Charles ended up signing with a Class C minor league team from Kansas that paid him $50 a month. Adams pitched for the Missouri Valley League’s Parsons Preachers in 1905 and was stellar on the mound, posting a record of 21-9, supported by a 2.05 ERA. Following his solid season with Parsons, Charles received a trial with the St. Louis Cardinals during spring training in 1906. 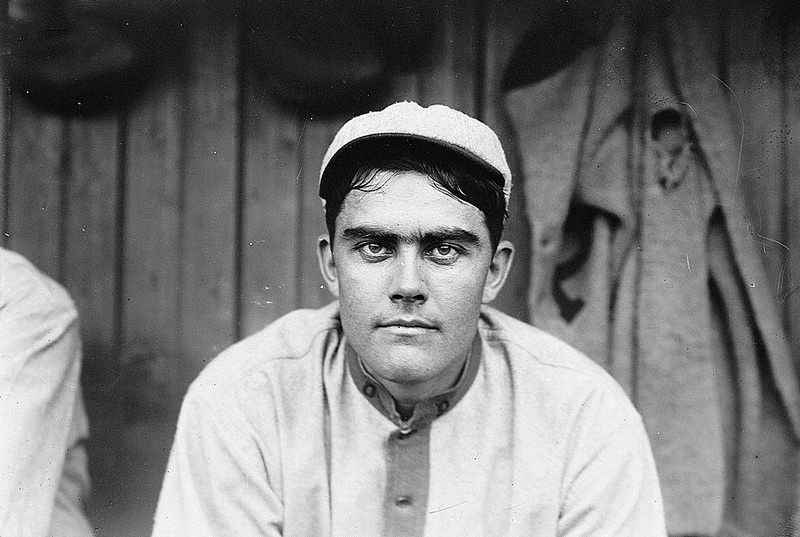 Adams made one uninspiring start for the Cardinals on April 18, before he was farmed out to the American Association’s Louisville Colonels, who then released him to the Denver Grizzlies of the Western League. After a rather mediocre season pitching for Denver in 1906, Charles Adams went 24-13, and posted a 1.99 ERA for the Grizzlies in 1907. Acting on a tip that Adams was the Western League’s top hurler, Pittsburgh Pirates owner Barney Dreyfuss traveled to watch the pitcher in action, before purchasing him outright from Denver in August. Charles was unimpressive for the Pirates in four late-season games as he registered no victories and two defeats. Pittsburgh farmed out Adams to Louisville in 1908, where he posted a 22-12 record, buttressed by an ERA of 2.08. While some stories claimed that Adams received his “Babe” nickname while pitching for Louisville, due to female baseball fans swooning over the handsome hurler’s features, he stated that the moniker was attached to him during his time with Denver. According to Adams, while attending a house party in Denver, a very pretty young woman approached, exchanged introductions, and inquired as to the pitcher’s middle name. This female offered a terse response when Adams refused to reveal his middle name. “Oh, you’re a big baby, and I’m going to call you Babe,” replied the attractive young woman in a tone of rebuke. Babe Adams secured a spot on Pittsburgh’s roster out of spring training at Hot Springs, Arkansas, in 1909. As was usually the case regarding rookie pitchers, Pirates manager Fred Clarke slowly eased Adams into the fray so he could become acclimated to baseball at the major league level. Babe became one of Clarke’s most dependable pitchers during the season’s latter stages, as Pittsburgh claimed the National League pennant in 1909, finishing six and one half games ahead of the defending champion Chicago Cubs, with a record of 110-42. Adams had a fantastic rookie campaign as he made 25 appearances, started 12 games, went 12-3, and posted a 1.11 ERA. The Detroit Tigers, led by star outfielder Ty Cobb, were Pittsburgh’s opponent in the 1909 World Series. Speculation abounded regarding which pitcher Pirates manager Fred Clarke would select to start Game One of the World Series on October 8, at Forbes Field, Pittsburgh’s brand new baseball palace located in the Oakland section of the city. Clarke had at his disposal staff ace Howie Camnitz, who won 25 games in 1909, veteran Vic Willis, who topped the twenty-victory mark that year for the fourth consecutive season with Pittsburgh, and southpaw hurler Albert “Lefty” Leifield. The Pirates’ manager played it close to the vest announcing his choice. The big decision wasn’t rendered publicly until about 15 or 20 minutes before Game One started. When the moment arrived for Pittsburgh’s pitchers to begin warming up, Clarke made his startling revelation that shocked Babe Adams and other teammates who were within earshot of Pittsburgh’s manager. “Get out there, Babe, and warm up,” said Clarke coolly as though this was just a regular game. Although Adams was astounded that he had been selected, the rookie pitcher showed no signs of nervousness since he wasn’t an excitable individual. After a shaky first inning where he allowed one run, two hits, and walked two Tigers batters, Babe settled in quite nicely on the mound. Pittsburgh tied the game in the fourth inning, when manager and left fielder Fred Clarke blasted a solo home run. The Pirates added two runs in the fifth inning and another tally in the sixth to take a 4-1 lead. Detroit attempted to stage a rally in the seventh frame when two men reached base with two out. Ty Cobb stepped up to the plate and worked the count to three balls and two strikes. With the hard hitting Sam Crawford waiting on deck, Babe Adams knew he had to give Cobb a pitch to hit. Ty took a toe hold in the box as Adams fired the ball toward home plate. Cobb’s bat connected against the pitch and sent the baseball soaring toward the right-center field gap. The drive seemed destined to land for extra bases as Pirates center fielder Tommy Leach started in speedy pursuit of Ty’s blast. Leach turned at just the correct moment and grabbed the baseball out of the air for the inning’s final out. Detroit never threatened again, as Adams secured a 4-1 victory in Game One, while scattering six hits. One decade after Babe had pitched in this monumental game, he offered his impressions regarding that afternoon at Forbes Field. Babe Adams’ natural feeling permeated once again when he took the mound in Game Five at Forbes Field on October 13. It was a brisk, cold day in Pittsburgh as the Pirates and Detroit Tigers battled to gain an advantage, with the World Series tied at two games apiece. The contest was a tight affair during the early going, and stood at 3-3, until Pittsburgh busted loose with four runs in the seventh inning. Adams went the distance for the second time in the World Series, allowing six hits, as Pittsburgh prevailed, 8-4, and grabbed the series lead, three games to two. Although Babe was brilliant once again dominating the Tigers, he ultimately was vanquished by a strong, frigid wind that blew across Forbes Field, causing the Pirates rookie hurler to catch a heavy cold, and leaving his status for future action in doubt. Ronald T. Waldo is a baseball historian, author, and lifetime resident of Pittsburgh, Pennsylvania, who has written eight books chronicling the great game of baseball’s storied history.His first book, Fred Clarke: A Biography of the Baseball Hall of Fame Player-Manager, was released through McFarland Publishing in 2010. Other books related to the Pittsburgh Pirates quickly followed, including a biography covering Hall of Fame outfielder Hazen “Kiki” Cuyler’s career and life, a look at the life, times, and baseball career of the great Honus Wagner through interesting stories and tales, and perspectives surrounding the 1902, 1925, and 1938 Pirates teams. Mr. Waldo’s latest literary endeavor through Rowman & Littlefield Publishers, titled Baseball’s Roaring Twenties:A Decade of Legends, Characters, and Diamond Adventures, was released in April of 2017.This work examines the baseball era of the 1920s, through stories and accounts connected to unique diamond characters and fascinating events from that time period.Baseball’s Roaring Twenties is a follow-up to Characters from the Diamond:Wild Events, Crazy Antics, and Unique Tales from Early Baseball, which was released in March of 2016 through Rowman & Littlefield Publishers. Besides possessing a deep passion for baseball history and the current state of affairs connected to this grand game, Mr. Waldo also enjoys following hockey, soccer, and football.